The current free exhibition at the National Portrait Gallery is ‘Face of Britain’, or, to be more accurate, ‘Simon Schama’s Face of Britain’. I did not see the five part BBC series which accompanied it nor have I read the book or watched the DVD, so I came to this with no knowledge of Schama’s commentary. The eminent historian has, with the NPG curators, chosen a selection of portraits to represent Britain and Britons, echoing the intentions of the founders of the NPG in 1856, who chose to inspire their fellow Britons through the portrayal of the nation’s heroes. It’s worth a visit. There are five rooms and an introductory area, each room having a theme – ‘People’, ‘Fame’, ‘Power’, ‘Love’ and ‘Self’. The themes range wide, so the ‘The Face of Love’ room includes not only Annie Leibovitz’ photographic portrait of a naked John Lennon with Yoko Ono, hours before he was killed, but also the work of an artist who provided some condolence to Victorians by painting their dead children. There are more conventional portraits of loved ones, men, women and Lewis Carroll’s pictures of Alice Liddell. 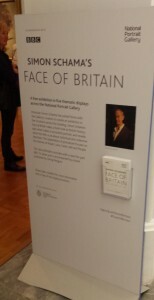 ‘The Face of Power’ shows royalty and rulers, from the first Elizabeth to the second and includes oil and pencil sketches of Sutherland’s famous portrait of Churchill, subsequently destroyed. The power here is not just the worldly power of those painted or photographed, but the balance of power in the relationship between artist and sitter. ‘The Face of Self’ is my favourite room, it showcases self-portraits, often of the artist in the act of painting, as in ‘Dame Laura Knight with model’ and ‘Sir Joshua Reynolds’. 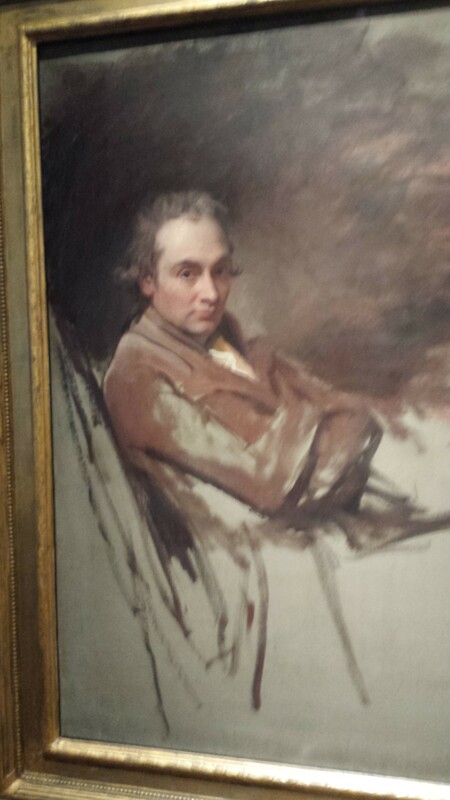 George Romney portrays himself in a strop, a grumpy mood – here’s an artist saying ‘Bugger off’ – I liked it. 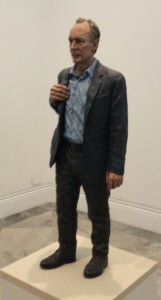 The self-portraits range from 1564 to 2006 and Marc Quinn’s sculpted head made using his own blood. ‘The Face of the People’ is devoted to those less than great and good, photographs, etchings and silhouettes of ordinary people going about their daily lives. Here you also find the non-establishment heroes, the bare-knuckle prize fighters, Tom Molineaux and Bill Richmond, the dwarves and giants, including an etching of Patrick Cotter, the Irish giant also know as The Giant O’Brien and the subject of one of Hilary Mantel’s saddest novels. Then there is ‘The Face of Fame’ a collection of nationally re-known figures from Sir Francis Drake in the 1500s to Diana, Princess of Wales in 1997, via Shakespeare, Nelson, Lady Hamilton and, because lasting fame sometimes begins with celebrity, the actors, David Garrick and Sarah Siddons. Cartoons are represented here, too, with three by ‘Alick’ Ritchie. My favourite painting of the exhibition? 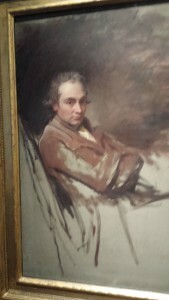 Well, I’ve always liked the Laura Knight and I was charmed by others, but the one which sticks in my memory is the unfinished painting by Sir Thomas Lawrence of William Wilberforce, the anti-slavery campaigner ( and campaigner for other good causes see Amazing Grace ). Wilberforce declined a peerage, lost most of his money and his home, by paying off his son’s business debts (despite there being other funding available), suffered ill-health for much of his middle and old age and yet was said to be full of ‘warmth and kindness’. I like to think that one can see this truly good nature in the painting. The exhibition is free and runs until 4th January 2016. If, like me, you haven’t seen the series, read the book, etc. I would advise that you look at the NPG web-site before going to the exhibition, it will enrich your experience. And take a look at the remarkable sculpture of Sir Tim Berners-Lee just outside one of the exhibition rooms, it looks about to step down from its plinth.